ISO 9001 is the internationally recognised standard for Quality Management Systems. In 2015 it received a major review and update that has required many businesses to modify their quality management system. Since the 2015 update Lordgate have been working hard, with assistance from BSI to meet the transition requirements.  And following a programme of transition audits we have now been fully certified to BS EN ISO 9001:2015. Whilst our core operations haven’t changed, we’ve made improvements across the board and altered the way we think about certain aspects of our business. Planning is a key area that’s undergone improvements. We’ve adapted our processes to consider an extended range of interested parties when analysing potential risks. This means we’re now looking at a much broader spectrum including supply chain in addition to our customers, employees and relevant regulatory bodies. We are now putting more resource into identifying potential risks in all aspects of the business, especially in the planning stages allowing us to highlight critical aspects of production and reduce the chances of difficulties arising by implementing preventive actions. One of the major points of the revised standard that we’re concentrating on is use of the Process Model and continual improvement. We’ve taken the time to identify all of our existing processes and over time we will be analysing their effectiveness. This analysis is giving us more insight into where we can reduce waste and improve efficiency, not just in production areas but throughout the company. So far we’ve had some great successes making things better for employees and systems are being introduced that bring additional control to operations. Our transition to the 2015 revision of ISO 9001 has pushed us to make some big changes and we’re benefiting a great deal; some of our most notable improvements have been to key processes such as a more thorough system for reporting and dealing with internal non-conformances, the addition of more detailed reporting of quality performance, and building stronger relationships to reduce supply chain difficulties. It’s likely you won’t see many of the changes that we’ve implemented and are implementing, you’ll still receive the same great service that we pride ourselves on. We are introducing a number of forms that help us keep control of our processes so as a customer, or as a supplier you may see some of these. The majority of changes are taking place behind the scenes to help us process work more efficiently, we hope that this improved efficiency will be passed on to our customers and welcome any feedback to help us improve further.